Editor’s Note: Keep digging and researching, and trust your gut instinct when reporting stories that people may not want to believe are true. That was the message award-winning author and scholar of Cambodian history Elizabeth Becker had for journalists during a recent interview with VOA Khmer’s Ten Soksreinith. Becker spoke about a recent article in the Columbia Journalism Review about her 1978 visit to Pol Pot’s Cambodia and her decades long dispute with another reporter on their starkly different coverage of the country following their trip. That year Becker and veteran journalist Richard Dudman, of the St. Louis Post-Dispatch, were granted rare access to visit Khmer Rouge-controlled Cambodia and report on what they found. Dudman and Becker left the country after escaping an assassination attempt that claimed the life of left wing British academic Malcolm Caldwell. They also left Cambodia with two very different stories. Dudman believed Cambodia under the Khmer Rouge was similar to other post-conflict countries struggling to rebuild after a devastating war. 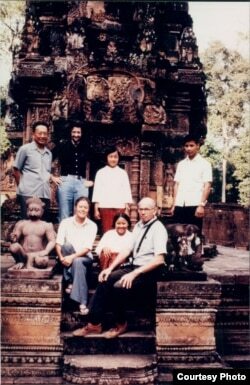 Becker, guided by instinct and the experience of living in Cambodia before the Khmer Rouge take over, knew that what she had been shown by the regime was not the Cambodia she had known before the war. Almost four decades later, while giving evidence at the war crimes trials of former Khmer Rouge leaders Noun Chea and Khieu Samphan, Dudman finally admitted that his account of Cambodia from 1978 had got it very wrong. Becker’s reporting from that trip had been right all along about the brutality of the Khmer Rouge regime. VOA: What made you write for the Columbia Journalism Review about your and Mr. Dudman’s reports on Cambodia under the Khmer Rouge in 1978? Elizabeth Becker: Because it was an unusual circumstance where you had two reporters disagreeing about something as profoundly important as genocide –two reporters who had seen exactly the same things and had the same interview. But that was a long time ago. What makes it especially important for the Columbia Journalism Review is that, nearly 40 years later, that disagreement came out in the tribunal, the Khmer Rouge tribunal, and one journalist admitted that he was wrong. It was almost a classic case for journalists to look at a difficult situation like that and possibly learn a lesson about how you cover such a difficult topic. VOA: What came to mind when Mr. Dudman accepted, during his testimony, that his report after the visit to Cambodia was “too positive or too uncritical”? Becker: It was interesting. I was already back to the United States and I watched on my computer. It [was a] live-stream because it was almost several months after I had appeared [at the tribunal]. The defense had thought that he would discredit me. They were trying to use him to discredit me. At first, he said he stood by his reports because that’s what he believed at that time. It was only later in his testimony that he said he had subsequently, after he read other things, he said he realized that, in fact, there was genocide under Pol Pot and the Khmer Rouge. I just thought, oh, one is that he’s an honest man, and two, it made me sad that it took so long because his reporting was important and people believed it. VOA: How and when did people start to change their perception about the Khmer Rouge and Pol Pot? Becker: The first major, major big change was when the Vietnamese overthrew Cambodia’s Khmer Rouge in 1979 and gradually opened [the country] up to journalists and researchers. So, we were able to go to places like Toul Sleng [the Khmer Rouge’s interrogation center in Phnom Penh] and find the documents. That was critical, that all of a sudden we had documents and [could] prove that, in fact, they [the Khmer Rouge] were that bad. But, and this is a big BUT, in those days, the United States, Europe, and most of the Southeast Asia [nations] did not like the Vietnamese occupying Cambodia, and therefore, they didn’t want to discuss the issue. So, you had journalists and writers, using…research to write books, such as I did, my book “When the War Was Over.”At the same time, you had the political forces that were so anti-Vietnamese that they didn’t want to discuss the Khmer Rouge. So, it took forever for justice to be brought, to come, to Cambodia. And the tribunal didn’t start until 2005, and they were overthrown in 1978. That’s the horrible stain, the horrible record. VOA: You mentioned in your article that you read articles about Cambodian refugees telling stories of forced labor, starvation, killing. If you had not read those reports, do you think you would have investigated the possible crime of genocide during your visit in 1978? Becker: First of all, when I lived there [in Cambodia], it was during the war for two years…. During the war, I watched how things changed, and that was very important because I got to know Cambodia, Cambodian life, Cambodian culture, and I knew what the war was doing to the country. The refugee reports only came out after the war, when I was back to Washington DC and there were many [reports], there wasn’t just one. There were many stories and a lot of my colleagues in the press wrote about what the refugees said –those who escaped the Khmer Rouge. The problem was that not many people could escape [Cambodia] –a few thousands, not hundreds of thousands. People didn’t know what to expect. They didn’t know if this is true or exaggerated, and there were so few refugees who could get out. So, I read all the stories and I read the reports in the UN human rights commission, which [was] pretty new at that stage. So, I took it seriously and, of course, those are very important stories because that told me one very important channel of information about what was going on in the country…. [Cambodia] was even more closed than North Korea is today. I could not exaggerate how hard it was to know what was going on. There was no communication to the outside world, separated from the government. There was no mail. There was no telephone. This is way before the Internet or email. There was no way to reach normal people. The only way you [could] contact anything or anyone in there was sending a cable to the government. That was it. So it was very closed off. 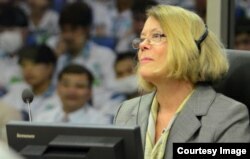 VOA: During your testimony at the Khmer Rouge Tribunal, what was going on in your head while the defense attorney questioned the credibility of your report? Even though there were thousands of documents used against Khmer Rouge leaders as evidence of crimes against humanity and war crimes. Becker: Well, what was interesting was that the defense was so weak that they had to bring this up, because, as you said, the documents proved the case…. They had very little defense, but it still made it very uncomfortable. When the defense tries to discredit you, it is no fun. However, I became more comfortable and I realized, regardless of ourselves, the important thing was to be as strong and convincing as I could be, in order to make sure that the truth came out. So, something happens to you when you testify –that your own personal comfortableness starts to disappear, and you say: ‘This is bigger than me. I have to make sure that the court understands the truth,’ and that sort of kicks in and sort of carries you. VOA: At the end of your article you say that it is not enough to report what you saw, and writing or telling a story of genocide is not something any leader would want to hear or be told. What do you mean by that? I asked all of that stuff [in 1978] and they could not do it. So, it’s very important to know a lot about the country before you go there, to know a lot about what was before and to push, push, push for answers. This is not a normal reporting assignment. If you cannot control your schedule, if you cannot control who you see –when they control everything, which is the case often in these things –that’s important. We got used to the idea [of] being embedded which sometimes is good. But embedding can also mean that you don’t get to see what you really should be seeing. You have to fight that all the time. I think it’s very relevant. 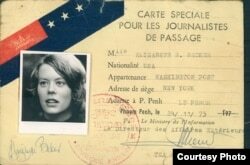 VOA: From your time to today, how do you think journalism has changed in relation to gender? Becker: The period in the seventies, I was one of the very few female reporters. Most of the time, I was the only one in Cambodia. Yes, people were not used to women reporters. It’s changed fortunately, because there are a lot more women like you covering the news and that’s very good, because people [are] getting used to women being reporters, to being authoritative and responsible and respected. Mr. Dudman was 30 years older than me. He was the foreign affairs’ correspondent for St. Louis Post-Dispatch. So, he had seniority. But more than a few women have come [forward]…saying this is what women used to have to go through. It’s a different era, but still something to be considered. VOA: The headline on your Columbia Journalism Review story states: “Two reporters escaped with their lives, but left Cambodia with a different story. History shows one was right.” What is the message? Becker: I think journalists today often have similar…traumatic situations. I wanted them to know that even if the world doesn’t believe you, don’t give up. I want journalists to know if journalists write stories that people don’t want to believe, stick to your gut. If you are confident and you keep showing through your research and reporting that you were right, just stick to your gut. Even when the rest of the world doesn’t believe you, and that happened to me, it doesn’t matter. Fortunately in this case, history has proved me right. That’s why I wrote the book to encourage people to keep digging.